Windows does not allow you to install 3rd party themes. You have to patch some system files to be able to do so.This new version 1.1 will automatically patch the system files without the need of a 3rd party system file patcher. If the system files are already patched then it does nothing. To restore the patched files you will need to use Universal Theme Patcher. Windows 7 Start Button Animator is a free portable tool that allows you to set an animated start button in Windows 7. You can set any animated gif image as your start button. The procedure to change Start Orb with animated start button is pretty easy. 3. Click on Select Orb and choose your desired GIF animation. You can get animated GIF images on the forum. 4. Change Image Style to the style that best matches to your image. 5. Change Taskbar Position to the position of your taskbar. 6. If you want the tool to run every time Windows starts up then select Run on Startup. Windows 7 Start Orb Changer is a free tiny portable tool that allows you to change your Windows 7 start orb with one click. Windows 7 Start Orb changer takes bitmap file of new orb you want to replace with original orb file. You can use Google to search and download orb files. Windows 7 Logon Screen Editor provides an easy way to customize the logon background. Apart from Login screen change feature it also has also few extra customization tricks. Click on the “+” button to change the shadow and button transparency settings. You can select upto 10 images and Logon Screen Rotator will automatically rotate your Windows 7 logon screen. If you have been using Windows 7 then you will be aware of show desktop shortcut present at the bottom right of taskbar. The shortcut lets you to peek desktop when you hover your mouse over show desktop & act as Windows+D shortcut when you click on show desktop. Some might think this feature as useless for those users here is nifty tool, Windows 7 Show Desktop Button Remover. 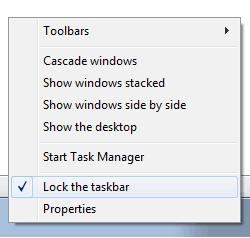 As the name suggest it lets you to remove “show desktop” button at the right-corner of the taskbar in Windows 7. The notification area also known System Tray is handy place to hide unwanted running applications or to instantly launch or monitor applications. With introduction of taskbar icons and grouping feature in Windows 7, you won’t find your Windows 7 taskbar cluttered even if you are running many applications simultaneously. But in case if you end up with cluttered taskbar in Windows 7 then here is one useful application which can create room for new applications on taskbar by hiding system tray area of Windows 7 Taskbar. Hide Systray is small utility created by Sebastian Langer of Deviantart user, which lets you to instantly hide & remove Systemtray of Windows 7 Taskbar. 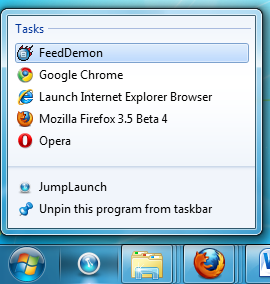 Windows 7 Taskbak aka super has many new feature for e.g Aero peek, Aero Snap, jump list and grouping of icons. Windows 7 taskbar lets you to group similar windows instances to save your taskbar real estate unfortunately grouping of icons of different applications is not possible. But you can get such feature in Windows 7 with Win7Stack. WinStackis an easy to use application that enables you to add stack-like functionality to icons for the new Windows 7 taskbar. Basically you select the folder the use and the icon and Win7Stack will create the stack on your desktop. 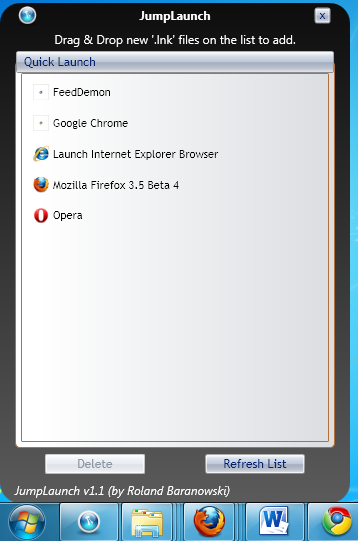 You can then easily pin the stack to your taskbar. You can specify Your own icon for group applications with displaying styling as Grid or Fan Look with Aero interface. Everyone knows about Windows 7 taskbar aka superbar which shows application & program icons instead of name. Whenever you start any application or program, icons are added to left of the windows 7 taskbar next to start Orb.If you wish to have taskbar icons at the center of Windows 7 taskbar to have dock like look then…..
Quick Launch Bar feature was first introduced in Windows XP to allow users to create list of favorite programs to open with a single click, without having to go through the Start menu. 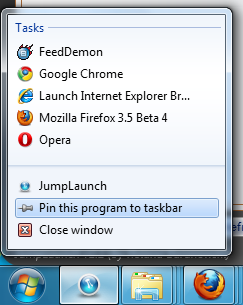 Unfortunately Microsoft has removed Quick Launch Bar from Windows 7.Here is simple app Jumplaunch which can display quick launch shortcuts in a jump list.